The 13th Nagaland Legislative Assembly election 2018 will be held on February 27 and the results will be declared on March 3. The twists and turns in Nagaland state politics ahead of the 13th Assembly election are worthy of a Bollywood movie script. High drama was witnessed late last month when all the prospective candidates cutting across political parties declared they would boycott the upcoming polls, demanding that the Central government solve the long-pending Nagas' fight for self-determination before the elections. But things took a U-turn in no time, with candidates rushing off to file their nomination papers just a few days later. This led to the dissolution of the Core Committee of Nagaland Tribal Hohos and Civil Organisations (CCNTHCO), which started the "solution before election" demand and made 11 political parties sign an agreement not to contest the elections until the government of India fulfilled their demand. A hectic election campaign kicked off with a little push and shove across the state. Polling for 59 seats of the 60-seat Assembly will be held on Tuesday, February 27, across 2,196 polling booths and 555 polling stations spread across the state. 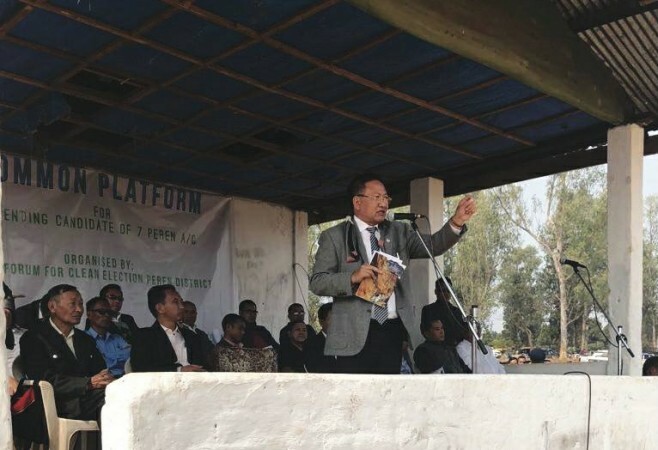 Former state chief minister and Lok Sabha member Neiphiu Rio, who filed his nomination paper with a ticket from the newly-formed Nationalist Democratic Progressive Party (NDPP), was declared as elected uncontested from the 11 Northern Angami II Assembly constituency after his lone rival Chupfuo Angami of the Naga People's Front (NPF) withdrew his nomination. A total of195 candidates (excluding Neiphiu Rio) will contest in the 13th Nagaland Legislative Assembly Elections, 2018. Newly-formed regional party NDPP has agreed for a pre-poll alliance with the Bharatiya Janata Party (BJP). The NDPP will contest from 39 constituencies (won one uncontested) and the BJP from 20 seats in the elections, with three-time Nagaland chief minister Rio as its chief ministerial candidate. The NPF, led by incumbent Chief Minister TR Zeliang, broke its 15-year alliance with the BJP after the latter struck a pre-poll alliance with Rio-led NDPP. Meanwhile, the incumbent NPF, which is contesting in 58 constituencies, hasn't entered into a pre-poll tie-up with any political party but reports have claimed that it is involved in back-channel talks with the Congress for a possible post-poll alliance to make sure that the BJP-NDPP alliance doesn't form the next government in the state. The results of 13th Nagaland Legislative Assembly Election will be declared on March 3.